Making Keto Sweetened Condensed Milk is easier than you think! It only takes 3 ingredients and about 30 minutes of your time – and so many desserts that use Sweetened Condensed Milk will be at your fingertips. Sweetened Condensed Milk is one of those ingredients that you just can't find in stores in a low-carb or Ketogenic version. I'm hopeful that someday a company will make one, but until then, if you want to make desserts like Keto Gooey Butter Cake or Keto Microwave Caramels, then you're going to need to make your own Keto Sweetened Condensed Milk. Luckily, it's super easy – enjoy! Ice Cream Maker – super affordable & my pick! 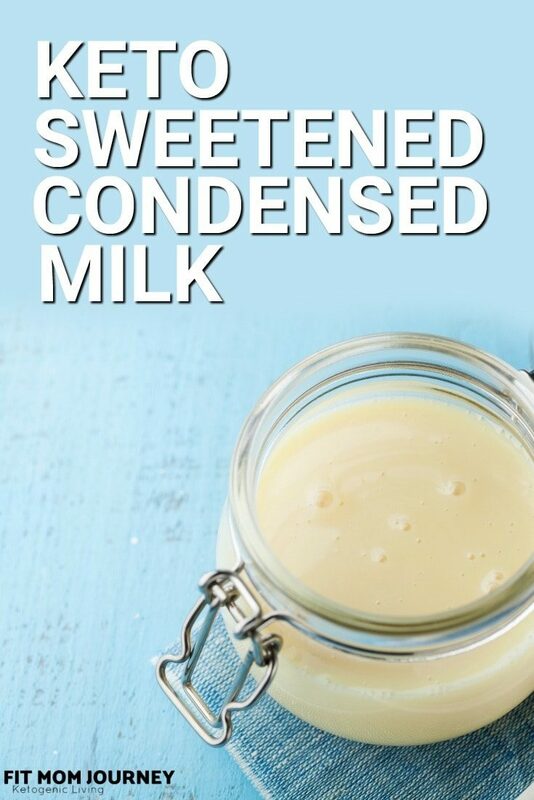 Making Keto Sweetened Condensed Milk is easier than you think! It only takes 3 ingredients and about 30 minutes of your time - and so many desserts that use Sweetened Condensed Milk will be at your fingertips. Bring the mixture to a boil while whisking, then drop the temperature down until the mixture is just at a simmer. Simmer the ingredients gently for 20-30 minutes, until it reduces to approximately half the volume as before. Pour the sweetened condensed milk into a container - preferably glass - and cool on the counter. Once it's cool to the touch it can be moved the refrigerator where it will continue to thicken. If you loved this recipe, please snap a picture and tag me on Instagram @fitmomjourneythem and use the hashtag #fitmomjourney! How long will the sweetened condensed milk lsit in the refrigerator?